In this file photo of Jan. 5, 1968, conductor Mitch Miller is seen at the Billy Rose Theater in New York. Miller, the goateed orchestra leader who asked Americans to "Sing Along With Mitch" on television and records, has died at age 99. His daughter said Miller died in New York City after a short illness. 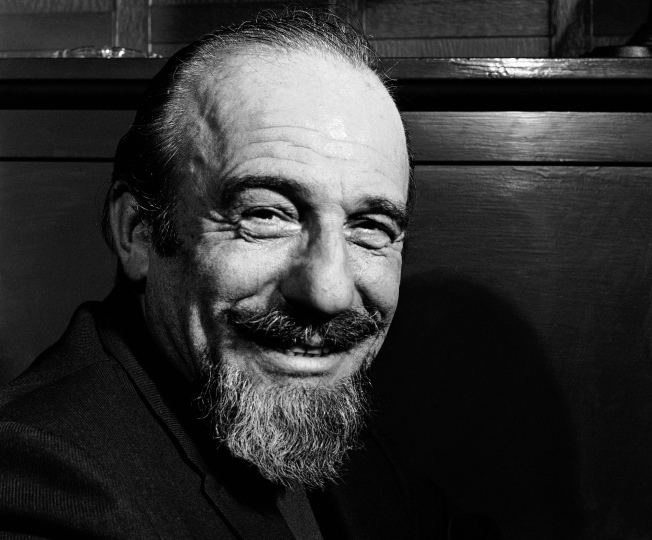 Mitch Miller, the goateed orchestra leader who asked Americans to "Sing Along With Mitch" on television and records and produced hits for Tony Bennett, Patti Page and other performers, has died at age 99. His daughter, Margaret Miller Reuther, said Monday that Miller died Saturday in Lenox Hill Hospital in Manhattan after a short illness. Miller was a key record executive at Columbia Records in the pre-rock 'n' roll era, making hits with singers Bennett, Page, Rosemary Clooney and Johnny Mathis. As a producer and arranger, Miller had misses, too, famously striking out on projects with Frank Sinatra and a young Aretha Franklin and in general scorning the rise of rock. "Sing Along With Mitch" started as a series of records, then became a popular NBC show starting in early 1961. Miller's stiff-armed conducting style and signature goatee became famous. The TV show ranked in the top 20 for the 1961-62 season, and soon children everywhere were parodying Miller's stiff-armed conducting. An all-male chorus sang old standards, joined by a few female singers, most prominently Leslie Uggams. Viewers were invited to join in with lyrics superimposed on the screen and followed with a bouncing ball. "He is an odd-looking man," New York Times critic Brooks Atkinson wrote in 1962. "His sharp beard, twinkling eyes, wrinkled forehead and mechanical beat make him look like a little puppet as he peers hopefully into the camera. By now most of us are more familiar with his tonsils than with those of our families." Atkinson went on to say that as a musician, Miller was "first rate," praising "the clean tone of the singing, the clarity of the lyrics, the aptness of the tempos, the variety and the occasional delicacy of the instrumental accompaniment." An accomplished oboist, Miller played in a number of orchestras early in his career, including one put together in 1934 by George Gershwin. "Gershwin was an unassuming guy," Miller told The New York Times in 1989. "I never heard him raise his voice." Miller began in the recording business with Mercury Records in the late '40s, first on the classical side, later with popular music. He then went over to Columbia Records as head of its popular records division. "Mitch Miller put me on the map by producing some of my very first million-selling records, and he was a great friend and a magnificent musician," Bennett said in a statement. Miller had a less rewarding collaboration with Sinatra, whose recording of the novelty song "Mama Will Bark," featuring dog imitations, was considered the nadir of the singer's career. Still, Miller became known for his distinctive arrangements, such as the use of a harpsichord on Clooney's megahit version of "Come On-a My House." He used dubbing of vocal tracks back when that was considered exotic. "To me, the art of singing a pop song has always been to sing it very quietly," Miller said in the book "Off the Record: An Oral History of Popular Music." "The microphone and the amplifier made the popular song what it is — an intimate one-on-one experience through electronics. It's not like opera or classical singing. The whole idea is to take a very small thing and make it big." Miller and a chorus had a No. 1 hit in 1955 with "The Yellow Rose of Texas," and that led to his sing-along records a few years later. The years of Miller's biggest successes were also the early years of rock 'n' roll, and many fans saw his old-fashioned arrangements of standards and folk favorites as an antidote to the noisy stuff the teens adored. As an executive at Columbia, Miller would be widely ridiculed for trying to turn a young Aretha Franklin into a showbiz diva in the tradition of Sophie Tucker. She left Columbia in the mid-1960s, signed with Atlantic Records and was soon transformed into the "Queen of Soul." But Miller was not entirely unsympathetic to rock 'n' roll, or to the counterculture. In 1969, he attended a massive demonstration in Washington against the Vietnam War. In a 1955 essay in The New York Times magazine, he said the popularity of rhythm and blues, as he called it, with white teens was part of young people's "natural desire not to conform, a need to be rebellious." He added: "There is a steady — and healthy — breaking down of color barriers in the United States; perhaps the rhythm-and-blues rage — I am only theorizing — is another expression of it." "Miller has often been maligned as a maestro of 1950s schlock ... Yet Miller injected elements of rhythm and blues and country music, however diluted, into mainstream pop," Ken Emerson wrote in his book "Always Magic in the Air." In the Martin Scorsese documentary on Bob Dylan, "No Direction Home," Miller acknowledged that he was dubious when famed producer John Hammond brought the nearly unknown Dylan to the staid Columbia label in the early '60s. "He was singing in, you know, this rough-edged voice," Miller said. "I will admit I didn't see the greatness of it." But he said he respected Hammond's track record in finding talent. Miller's square reputation in the post-rock era brought his name and music to unexpected places. In 1993, one of his "Sing Along" records was used by the FBI to drive out the Branch Davidian cult from its Waco, Texas compound. During Queen's nonsensical camp classic, "Bohemian Rhapsody," the group chants "Mitch MILL-uh!" as if to affirm the song's absurdity. Reuther said her father died of "just old age." "He was absolutely himself up until the minute he got sick," she said. "He was truly blessed with a long and wonderful life."